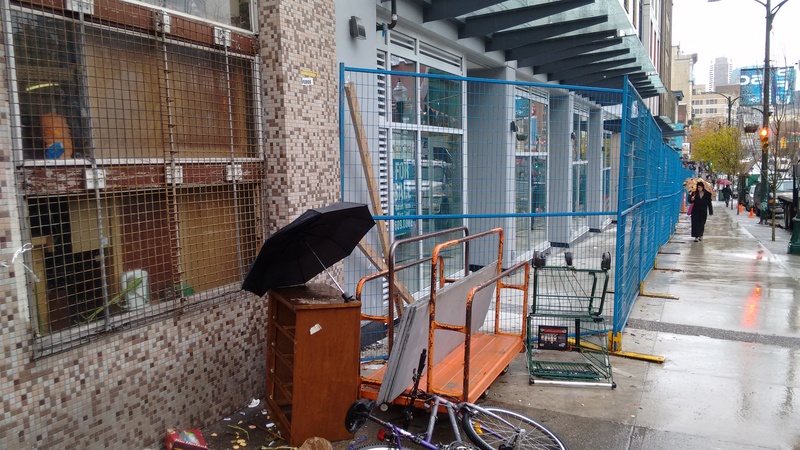 This month’s planned crackdown and displacement of low-income street vendors is set to coincide with the early-December opening of one of the most resisted condo developments in the history of the Downtown Eastside: Sequel 138. The condo project is located directly across the street from InSite and sits between two of the City’s largest Single-Room Occupancy buildings, the Brandiz and the Regent hotel. The development presents 79 condominium units and 10 high-end glass storefronts. 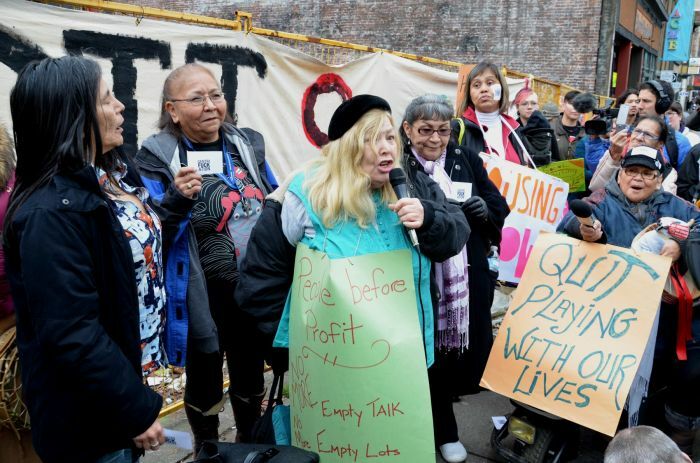 In 2011, nine major Downtown Eastside (DTES) community organizations formed a coalition — DTES not for Developers (DNFD) — in response to the condo plans for 138 E Hastings. Over 3,000 people and 40 community groups signed the DNFD community resolution to stop Sequel 138; every major social housing provider and DTES arts group also promised to not work with the developer. Despite this period of overwhelming community resistance, the development was approved by the Development Permit Board in 2012 and is now set to open in early December. Power of Women speak at a Pantages rally. Photo: Murray Bush (flux photo). The two six-storey buildings are comprised of 79 condominium units and 18 non-market rental units, half of which will rent for BC Housing Income limits ($912) and the other half at the welfare rental allowance rate ($375). Some condominium units have been purchased as investments and have already been advertised on Craigslist as “$1,500/1br Bedroom Condo.” The DTES is not mentioned in the craigslist advertisements and it is as though they are already anticipating the future displacement of the community. In addition to the residential space, there are also 10 high-end retail spaces on the ground floor. The spaces are priced between $500,000 and $1.36 million. Given the selling prices, these new retail spaces are not going to be affordable or inclusive to low-income residents, and, in fact, they exceed prices in most parts of the city. Despite only adding nine units of social housing to the mostly low-income neighbourhood, the B.C. government gave the developer $21.8 million low-interest loan for construction costs. They also loaned $814,000 to the FJL Housing Foundation, a charitable organisation that now owns the 18 non-market rental units. This kind of support for a private condominium development is unprecedented for BC Housing. Housing activists have dubbed it “BC Housing’s first condo,” and one journalist called it “the sweetest government deal” ever offered to a private developer. BC Housing defended its decision to bail out the developer, claiming it has a mandate to fund “revitalization” efforts. The move is part of a larger trend in recent years, with BC Housing taking an increasingly active role in supporting market developments in the DTES and across Vancouver. Last week the City of Vancouver held an open house for another similar development financed by BC Housing at 288 E Hastings. The development will have 68 market rental units, 70 BC Housing Income Limits units ($912 per month), and only 34 social housing units renting at the welfare rental allowance rate ($375). As with Sequel 138, the development will also contain several high-end retail spaces on the ground floor. Social mix developments in low-income areas, such as Sequel 138 and 288 E Hastings, are often justified because they include a token number of social housing units. The Woodward’s Building added approximately 125 units of social housing, yet about 404 SRO units were lost in a one-block radius of the development. Those affordable options have either been demolished or they have been upscaled, with rents doubled. Sequel 138 will add fewer social housing units than Woodwards, while putting more welfare-rate SRO rooms at risk of conversion. In fact, the 100 block of East Hastings has the highest concentration of low-income housing in the city and is the home to over a thousand low-income residents living on welfare and disability. Sequel 138 boasts its community value: it will have an Urban Agricultural Farm, an Arts and Media Centre, a Social Community Deck, and a Market Breezeway, a pedestrian walk-way which connects to Pender Street rather than an exit on East Hastings. 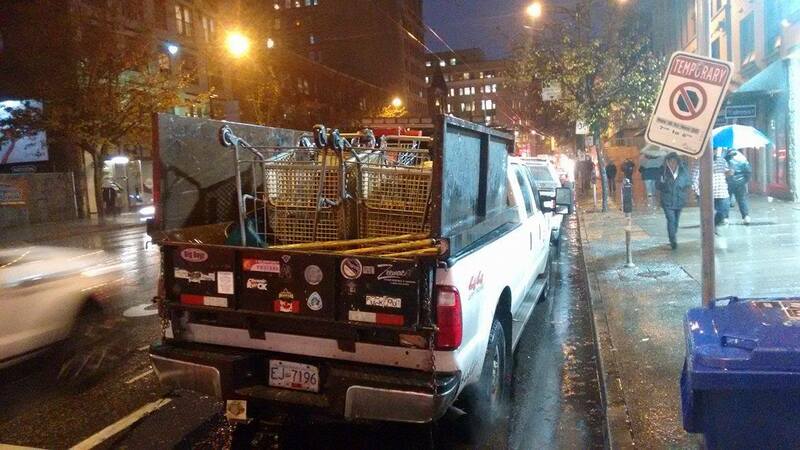 Yet, DTES residents see the development as a threat to their existing community. Much like the Woodward’s development, Sequel 138 offers only a small percentage of welfare-rate housing. These developments are euphemistically called “social-mix,” but often create a more segregated neighbourhood. In the Woodward’s case, residents of the social housing units must use a different entrance (also called the “poor door”) than those in the high-end units, while the constant surveillance (video and private security) creates zones of exclusion for poor members of the community, whose poverty and “otherness” is criminalised. The City is holding a meeting on Tuesday, November 17, 4:00pm – 5:00pm at Woodwards, 501 – 111 West Hastings Street, where they will go into more detail about what that larger VPD presence will look like and what they are hoping to accomplish through displacing poor and homeless people from the 0-300 block of East Hastings. Posted in Gentrification, Police, Uncategorized. Bookmark the permalink. This is long overdue. So glad the city is FINALLY taking action. Congratulations to everyone that made the new development possible! Its real sad when this kind of thing continues. I’ve lived in Vancouver for 25yrs and i was so in love with it! Now ive been forced on disability, i try to volunteer when I get a chance just to give back to society in some way. Im 47yrs old and can’t really share an apartment any more its to much stress. I can’t move back down town for fear of falling on bad habits again. Ive been off heavy drugs for almost 8 yrs. and don’t want to gp back fpr any reason. I have to move way out of the city and give up all i know and love dhue to the fact i will have to pay 2/3 of my income. Everything else barely covers my bills then i cant eat. Im not so proud of Vancouver anymore, there are people worse than me what are they going todo? You have a responsibility to look after ypur people, all your people! With comments like this you are doing what people in the DTES hate. You are prejudging and boxing together those who haven’t even moved into the area yet. Some of us who are moving into the area know what East Hastings is like and don’t necessarily want to push individuals out. It is just unfortunate that the only option for individuals who are on a median wage of 40k don’t have a lot of options to own here in Vancouver. Yes, everyone deserves a place to live. Yes, the options for ownership are limited. However, that is not the perspective of the developments as long-time residents of the DTES community are excluded with developments such as Sequel 138. The reason being is an inadequate number of welfare rate units included in the buildings. What if we challenged different levels of government to provide stable social housing? One of the reasons people want to own in Vancouver, and elsewhere, is because housing security is lacking. The need for housing security through ownership only exacerbates the problem by raising rents in the fewer and fewer places available for development in Vancouver. Everyone is getting fucked. Really. As a member of the working class who commutes to downtown for work everyday, I cannot afford to live or work anywhere near Vancouver. I own in Richmond and commute via Skytrain to work. Why should there be subsidized housing be provided on prime real estate for homeless and those on welfare. Can’t the provincial government make subsidized housing available in more affordable locales? What about Maple Ridge Mission or Chilliwack? I would love to live downtown but I cannot afford it.